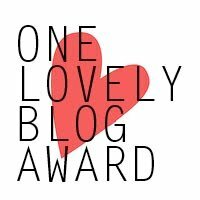 When I woke up this morning, I was thrilled to learn that dwittopinions (http://dwittopinions.wordpress.com/) had nominated me for a One Lovely Blog Award. Thank you! 1. My mother taught me pretty much everything I know about cooking/food/recipe preparation. In honor of Mother’s Day on Sunday, this blog post is for you, Mom! 2. My mother also has an uncanny knack for knowing when a recipe is meant for “show” versus for “eating”. Case in point is a mandarin orange & cranberry side dish (recipe here) that I insisted we prepare for Christmas Dinner last year. The dish looked stunning, but it tasted terrible – bitter, sour and unappetizing are the three adjectives that come to mind. I guess even Bon Appetit doesn’t get it right all the time and I am still learning to distinguish what will make a tasty recipe versus a “pretty” recipe. 4. The piece of equipment in my kitchen that I use the most is my convection oven. It’s great when you’re cooking for one or want to warm something up quickly without waiting on a full size oven to preheat. 5. I do triathlons and run half marathons in my free time. In my mind, this is how I reconcile cooking (and eating!) some of my less healthy dishes (See examples A, B, and C). 6. While I believe in indulging, most of the time I eat a generally healthy, low-sodium diet with lots of fruits and veggies. Normally, the only (non-alcoholic) beverages I drink are water, skim milk and (decaffineated) tea. 7. 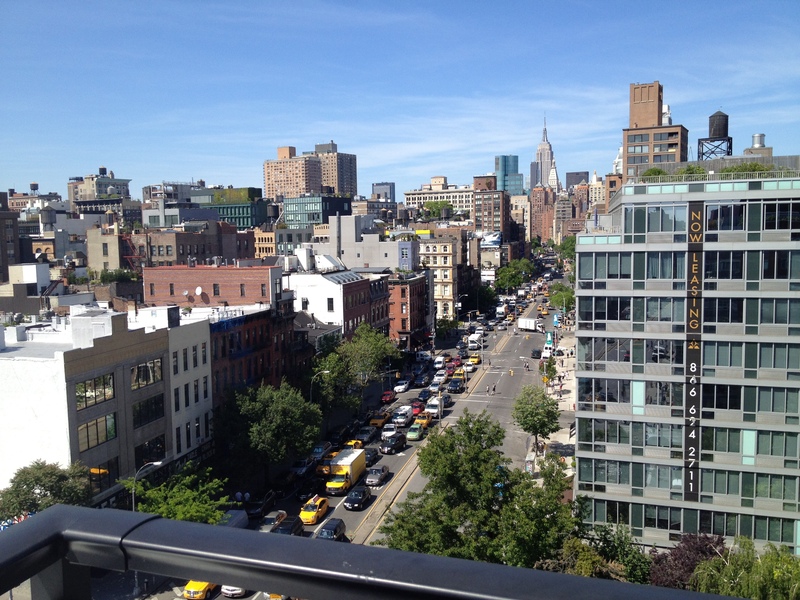 There’s nothing I like more than relaxing on my roof deck, enjoying a glass of wine and watching the sunset, all the while hearing the noises of NYC faint and far below. 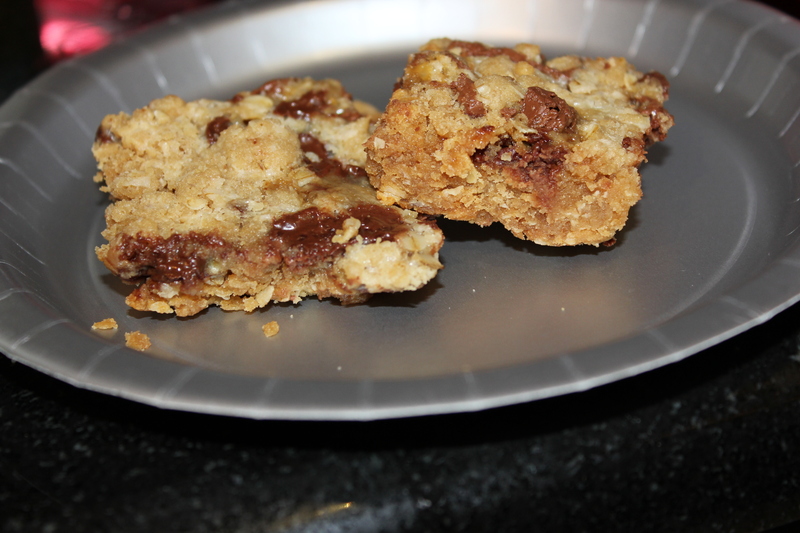 Chocolate caramel oatmeal bars are one of my favorite desserts to make for a party or to bring when visiting friends. They are very easy to make and are super rich, gooey and decadent. The best part is, because they contain oatmeal, you can claim they are healthy! 🙂 You can find my recipe below. Be careful with this dessert – they are so addictive that my friend Marc who runs a fitness company and has the best diet and self-restraint on the planet can’t even resist them! * I prefer to go the decadent route and use Ghiradelli Milk Chocolate & Caramel Squares cut into quarters, but mini Rolos or Rolos cut in half also work. If you are going to use full size Rolos or Ghiradelli squares, refrigerate the candy before trying to cut each piece. This way will be significantly less messy. 1. Preheat oven to 350 degrees. Line a 9″x13″ banking pan with parchment paper. 2. In a small size bowl, mix flour, baking soda and salt. 3. In a medium size bowl, using an electric mixer, beat together butter, brown sugar and vanilla until creamy. 4. Add flour mixture to medium size bowl. When mixed, add oatmeal and mix until incorporated. 5. Using floured hands, press about 2/3 of the mixture evenly into the baking pan. Bake until deep golden brown around edges, about 25 minutes. Meanwhile, add 1/2 the chocolate-caramel candies to the bowl with the remainder of the oatmeal mixture. Mix well with floured hands. 7. When the bottom layer is finished, remove from oven. Evenly drizzle condensed milk over hot base. Sprinkle chocolate chips and remaining chocolate-caramel candies over condensed milk. Finally, add oatmeal mixture containing the chocolate-caramel over this. Note: This top layer will not fully cover the pan. 8. Bake until topping is deep golden brown and edges are bubbling, about 25-27 minutes. 9. Cool in a pan on a wire rack. When cooled, cut into small bars. 10. Serve warm with ice cream or alone at room temperature. Store in an airtight container in the refrigerator. One of my good friends Kristin is an editor at the fabulous blog A Woman’s Paris. I would highly recommend this site for anyone interested in French style, culture, cooking and more. In addition, the creator of the site is a talented artist and sells her whimsical drawings as iPhone and iPad covers at the following site. 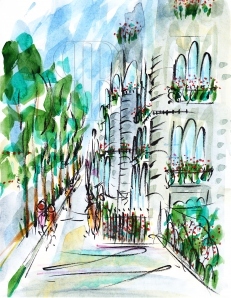 I love them all but I think the Avenue Montaigne drawing is my favorite. After my successful (but tiring!) attempt creating French macarons last year and talking with Kristin about French cooking, I was inspired to try and create a classic French dish but to add a Southern twist to it. 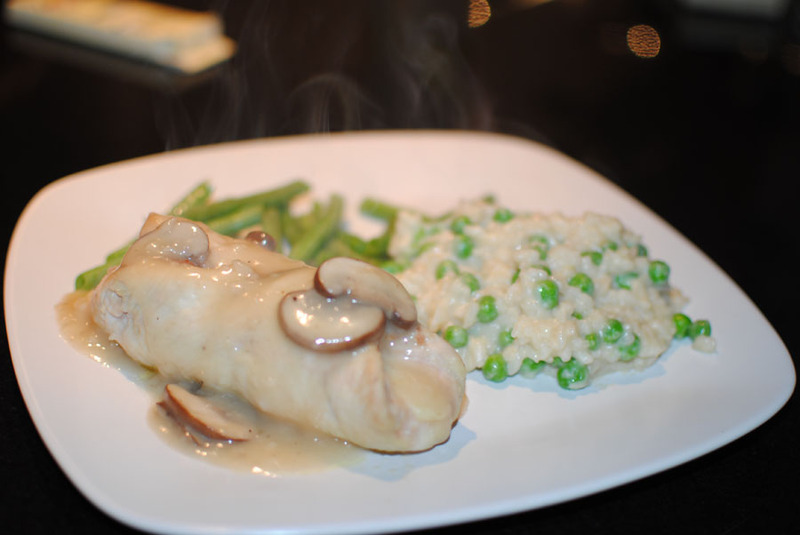 Below is my adaptation of the famous French entree Chicken Cordon Bleu. This recipe has its roots in a Rachel Ray 30-Minute Meals episode that I watched years ago in college but never wrote down. The thick, hearty mushroom-gravy is what really makes this a “Southern” dish. Bring your appetite to the table when you make this dish – it’s rich and very filling! 3. Starting at one of the narrow ends of the chicken breast, roll each chicken breast up and secure with a couple of toothpicks. Coat each roll up in flour. 4. Heat a skillet using medium heat and add extra virgin olive oil. When heated, add the chicken breasts and brown. 5. When browned, place chicken breasts on a baking sheet and bake for 30-40 minutes until fully cooked. 6. 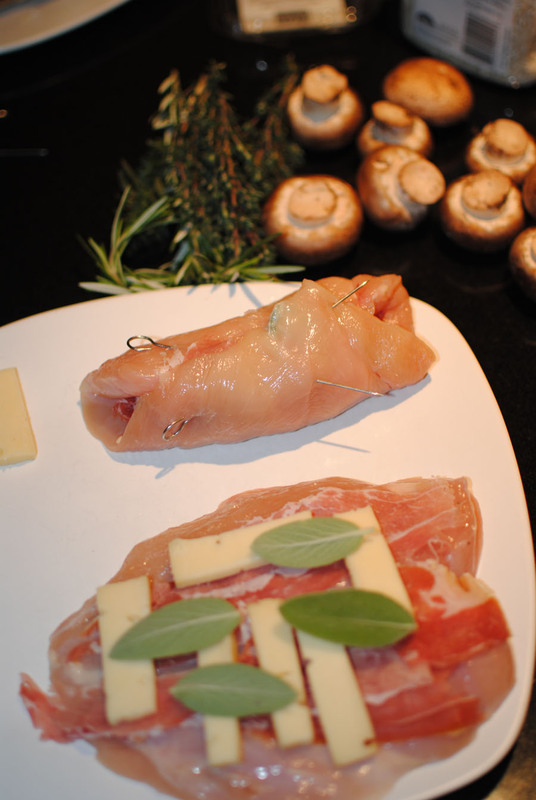 Remove from oven and place one breast on each plate. Remove toothpicks immediately before adding gravy and serving. 1. Heat a skillet over medium-high heat and add butter. When butter is melted, add mushrooms to skillet and cook until browned and soft. 2. Add flour and 1/4 cup wine and 1/4 cup chicken broth to skillet. Mix until incorporated and warm. 3. Season with salt & pepper. If you want more acidic sauce, add more wine. If you want thicker sauce, add more flour. I usually wing it here so apologies I can’t give more specific directions! 1. In a saucepan, heat chicken stock until warm but not boiling. Keep warm while you prepare the risotto. 2. Heat a large pot over medium-high heat and add butter. When melted, add garlic, rice and 1 cup chicken stock, stirring frequently. 3. When the chicken stock cooks off, ladle another cup of broth into the pot. Continue doing so until the rice is cooked, which should take about 20 minutes. 4. About halfway through cooking the risotto, try out the rice. If it is TOO chicken-y, substitute 1 cup of water instead of chicken broth when the liquid runs out for the next cycle. 5. When the rice is cooked, add the peas and Parmesan cheese to the pot, stirring rapidly to incorporate. 6. 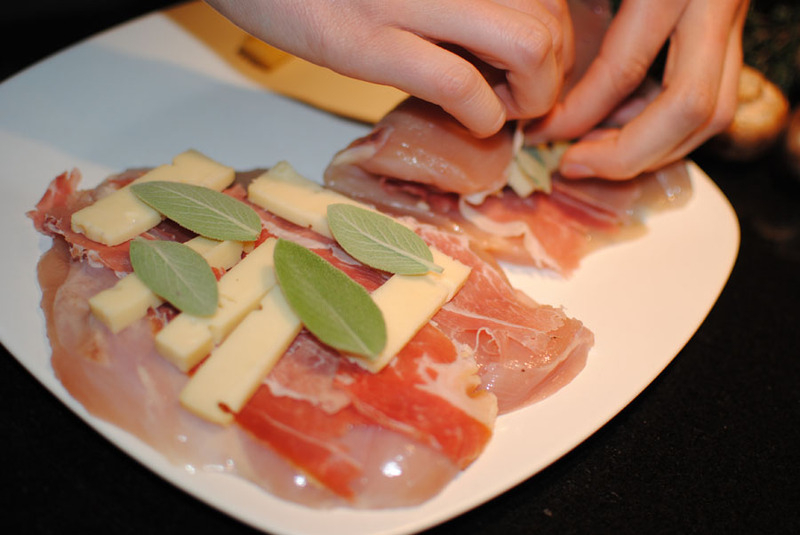 Serve immediately and top with freshly ground black pepper and an additional sprinkle of Parmesan cheese. Earlier this year, I attended a Pacific Northwest cooking class at The Institute of Culinary Eduation in NYC. D is from Seattle so I wanted to learn how to make some of the foods he loved growing up. We learned how to make cedar-planked salmon, venison, butternut squash soup and fire-roasted oysters, among other things. Nanaimo Bars were one of my favorite dishes we learned how to make, and, interestingly, D had never heard of them before! 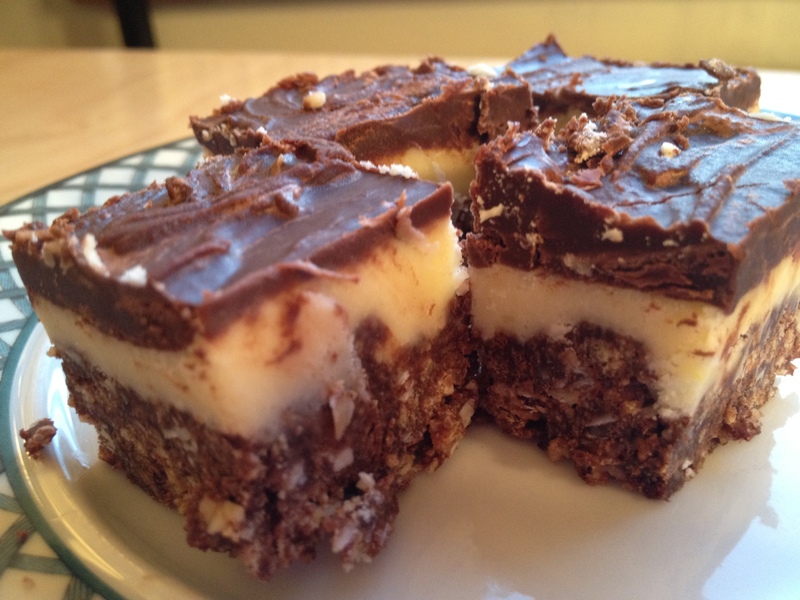 Nanaimo Bars are a no-bake three-layer cookie bar with origins in Vancouver. 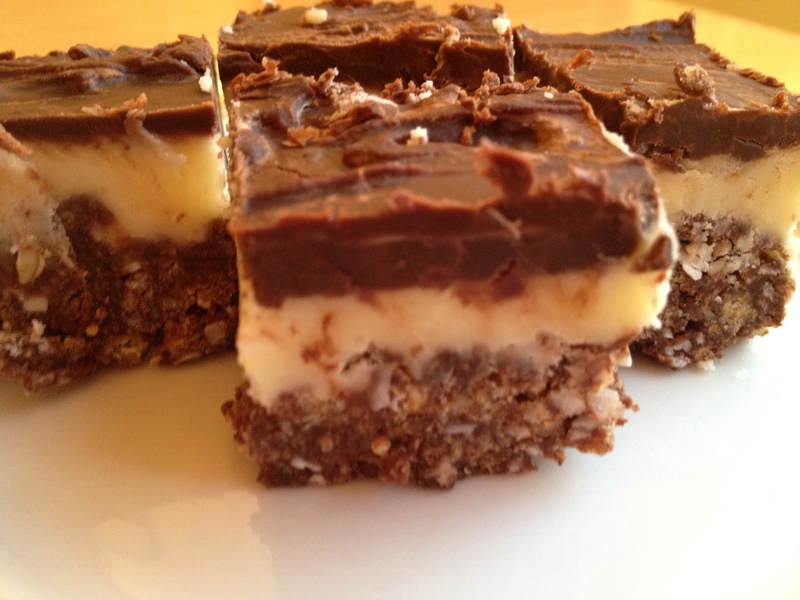 You can learn more about Nanaimo Bars on its very on Wikipedia page. 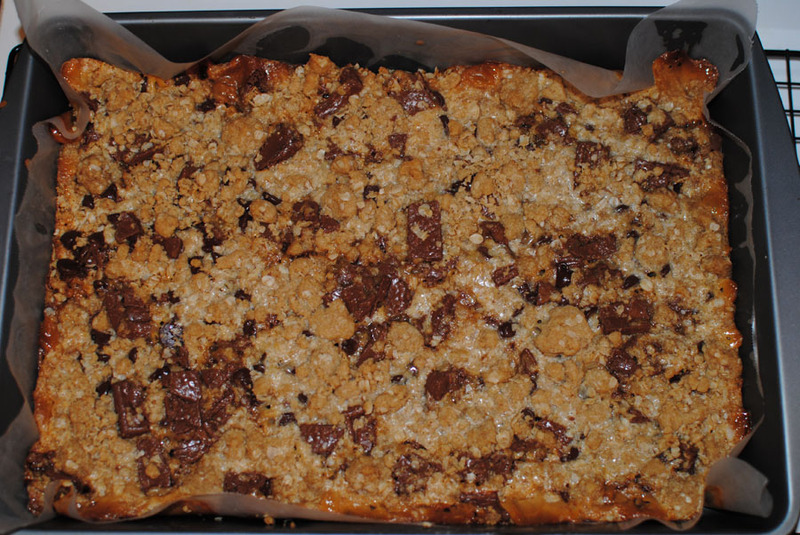 This dessert is extremely rich, so even though the yield is a small 8″x8″ pan, you can easily make 60+ bars from one pan because a serving size is so small. Below is my recipe adapted from the ICE Pacific Northwest Cooking Class. Enjoy! 1. Melt butter, sugar and cocoa powder in a double boiler. 2. Add beaten egg and stir to cook and thicken. When mixed, remove pan from heat. 3. Stir in graham cracker crumbs, almonds and coconut. 4. Press firmly into an ungreased 8″x8″ pan. 1. Cream butter, heavy cream, custard powder and powdered sugar together well. Beat until light. 2. Spread over bottom layer. 1. Melt chocolate and butter over low heat in a double boiler. 3. When cool, but still liquid, pour over middle layer. 4. Chill in refrigerator for at least 1 hour before serving. Serve cold or slightly cooler than room temperature. It’s 85 degrees in NYC today which means that spring is officially upon us! 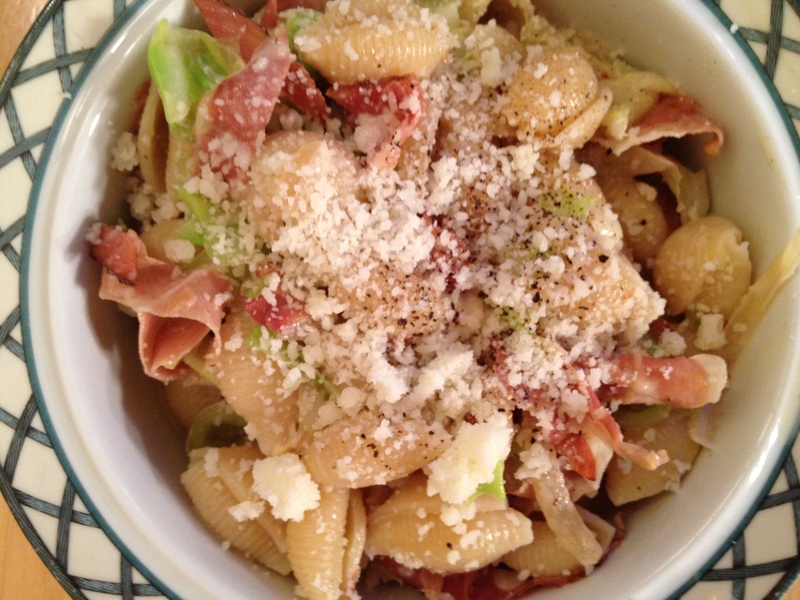 Last week I made a delicious pasta that is perfect for the final days of cold weather. Since I found this Andrew Carmellini (former A Voce chef) recipe in a Daily Candy post from 2009, I’ve made this recipe at least once every March/April. Cabbage is one of those veggies that I know is really good for you but I don’t love cooking with it, so this recipe is a great way to include it in my diet. Another added plus of this recipe is that it tastes awesome reheated so one pot of this can last me a few days. 1. Boil a pot of water. Just before adding pasta, add salt and a dash of olive oil to prevent pasta from sticking together while cooking. 2. Heat olive oil and butter in large sauce pot over medium heat. When butter has melted, add onions and speck and cook until onions soften, about three minutes. 3. Meanwhile, remove outer leaves of cabbage and cut in half. Remove hard white core and slice cabbage into thin strips. You should have about four cups. 4. Cook pasta according to package instructions. 5. While pasta cooks, add cabbage to onion-speck mixture and stir continuously until cabbage begins to wilt, about three minutes. At this point, if you pasta is not finished cooking yet, turn off the heat on the cabbage-onion-speck mixture and let it rest until the pasta is finished. 6. Drain the pasta, saving one cup of the cooking water (you will use if for the sauce). Return pasta to the pot you cooked it in. 7. Turn heat back on pan containing cabbage-onion-speck mixture to medium heat. Add cream, black pepper, salt, and UP TO one cup of pasta cooking water. (Note: I usually use 1/2 to 3/4 cup. It all depends on how thick you want your sauce to be.) Continue cooking, stirring occasionally, for two more minutes, until the cabbage has wilted but still maintains a little crunch. 8. Turn heat on pot containing the pasta and add the sauce. Mix well to coat pasta and cook for one minute, so the pasta absorbs some liquid. 9. While the pasta/sauce are cooking together, beat a raw egg. 10. 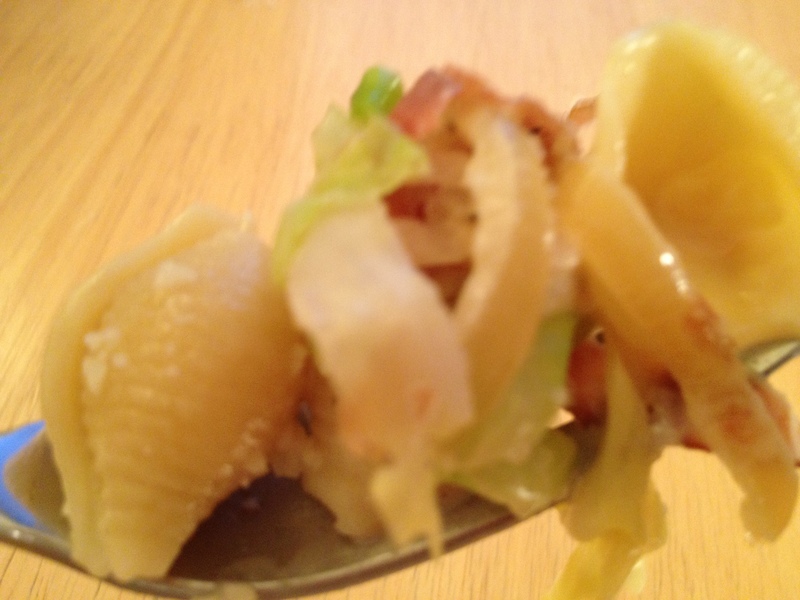 Turn off heat and add egg to pasta, stirring well so it cooks in the hot mixture. 11. Add cheese and stir. Add grappa and stir. 12. Serve immediately in large bowls topped by more cheese and a few cracks of black pepper. 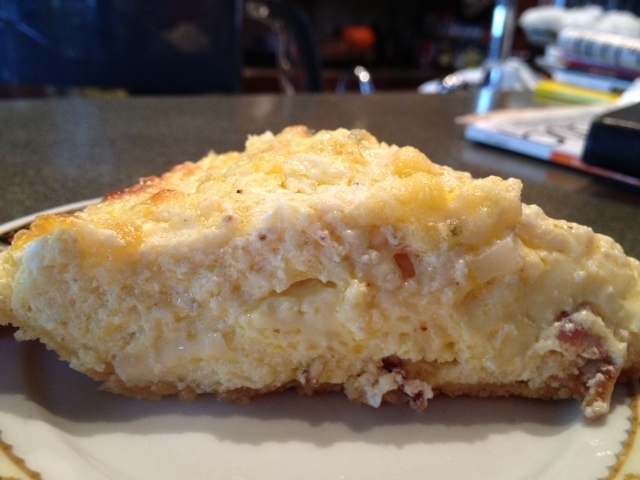 For Easter brunch tomorrow, I’m making my mom’s super easy and delicious quiche recipe. She has been making it for so long that she doesn’t use a recipe. It’s always delicious, but it tastes different with every preparation. I’m a stickler for following her recipe to a tee because I think the combination of spices is perfect. Also, this while this recipe calls for heavy cream and whole milk, you can substitute skim or low fat milk if you would prefer. 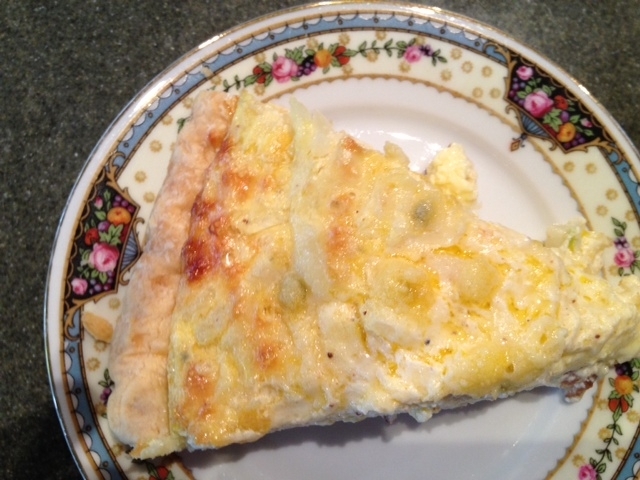 The resulting quiche will be less fluffy and creamy, but will still taste great with a lot less calories and fat. In my mind, whenever I make this dish it’s for a festive occasion, so I like to stick with the heavy cream and whole milk and indulge a little! Note: This recipe makes TWO quiches so if you only want to make one, halve the recipe. This quiche does well refrigerated for up to a week or frozen for a couple of months though so I always make two and have an extra on hand when a quiche craving strikes! 2. Squeeze a large dollop of Dijon mustard on top of each pie crust. Using the back of a spoon, spread so there is a thin layer of mustard along the bottom and sides of the pie pans. 3. Put crumbled bacon on the bottom of each pie pan. There should be enough to cover most of the surface area of both pans. 4. Add shredded cheese on top of bacon, dividing evenly between both pie pans. 5. In a large bowl, mix onions, flour, salt, cayenne pepper and nutmeg. In a small bowl, beat eggs. Add egg mixture to large bowl of dry ingredients. Slowly add in heavy cream and milk until fully mixed. 6. Pour mix into both pie pans on top of cheese, dividing evenly between the two. 7. Sprinkle parmesan cheese on top of each pie and spray a few times with spray butter or margarine. 8. Bake at 400 degrees for 15 minutes. Then turn temperature to 350 degrees and bake for an additional 30 minutes. 9. Let sit for 5 minutes before cutting. 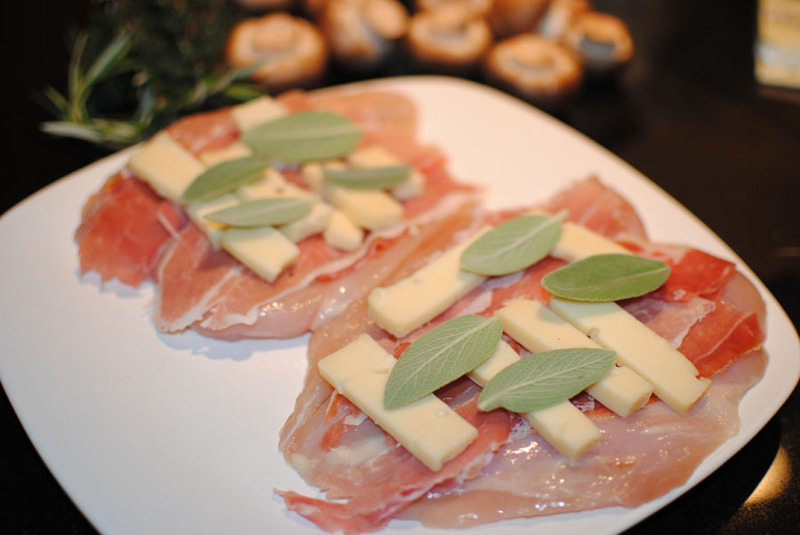 Tastes great reheated – simply microwave a slice or warm it in the oven at 350 degrees for a few minutes. For those of you looking for more of a sugar-filled Easter brunch, check out this link that my mom sent me for some special Cadbury Creme Egg recipes. I wish I lived in the UK because a Cadbury Creme Egg McFlurry sounds really yummy! When we want to go out for dinner but still be super casual, we visit the grill at our neighborhood Whole Foods and get their turkey burger. It’s much healthier than a beef hamburger, not greasy at all and comes with a large side salad. The best part of the WF turkey burger though is the tomato jam they put on the burger. It’s thicker than regular ketchup and slightly sweet. D challenged me to make some for us at home, which seemed like a daunting task until my March issue of Real Simple arrived and there was a recipe for tomato jam inside! 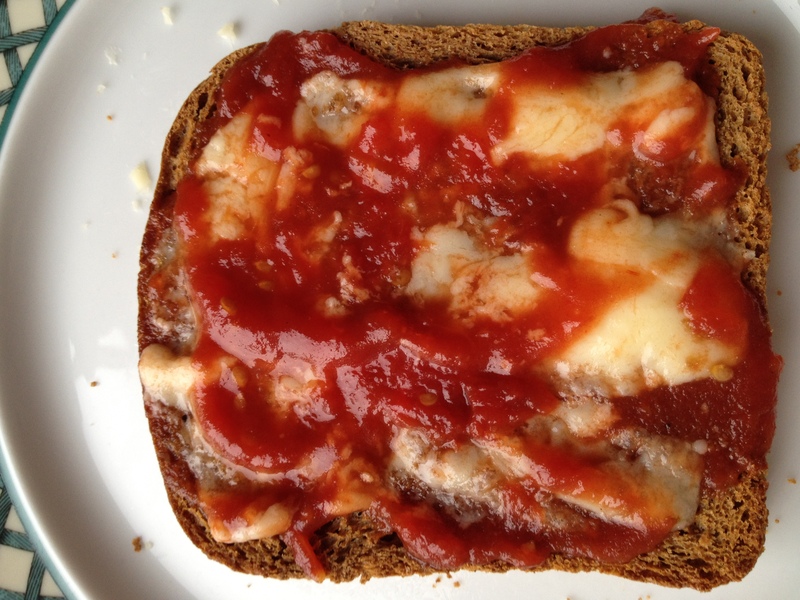 It is super easy to make and tastes so much better than Heinz ketchup (think: no preservatives, super fresh, slightly sweet). Here’s my recipe adapted from RS. Since I don’t like to cook with a lot of salt, I used low-sodium whole peeled tomatoes and a very slight pinch of salt for depth. 1. Empty the entire can of tomatoes (and juices – do not drain) into a deep large skillet. Add sugar and salt. Bring mixture to a boil, stirring frequently. 3. If you don’t like the idea of “thick” ketchup, once cooled, put in blender and puree until smooth. 4. Store in an airtight container in the refrigerator.